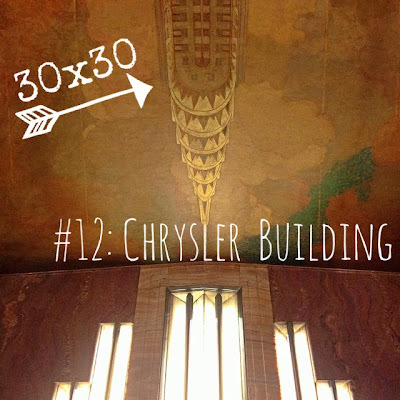 It's one of the most famous New York icons, yet I had never gone inside the Chrysler Building. Yes, I had admired it's Art Deco spire from afar, allowing images of dusty Depression-era builders working day and night to erect its' 77 floors to flood my head. But other than cursory glances at times when I wasn't looking down at my phone, the Chrysler Building had been nothing more than a passing thought. Until I made my 30x30 list. What better time to take in all that the building has to offer? And, come to think of it, how had I not taken a tour of the building in the five years I'd been living in this city? Because it's not allowed. More specifically, tourists are not allowed beyond the building's lobby. Unlike the Empire State Building or Rockefeller Center, there is no observation deck near the top of the Chrysler Building. Private offices occupy the entire building, and you must work there to use the elevators. Ok, fine. So I'll just look at the lobby. At least that's open to the public! And so I did. Taking advantage of a break in between nearby meetings, I walked over to 42nd and Lex, passed through the golden revolving door and into the rust-colored lobby. There were some info signs on the walls detailing the history and technical specification of the building, and it was populated by foreign tourists taking photographs, but beyond that, my entire "tour" took less than 10 minutes and was fairly anti-climactic. If you go: The entrance to the Chrysler building is located at 405 Lexington Ave (and 42nd Street); the lobby is open to visitors during normal business hours.